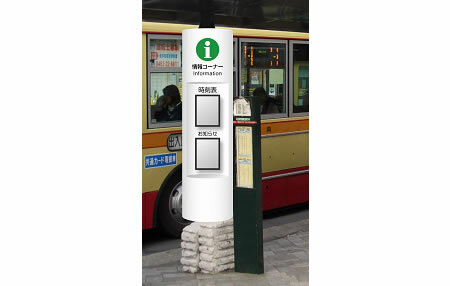 Kanagawa Chuo Kotsu Co. Ltd. (Kanachu) which operates local bus route services and chartered bus services in Japan and Atsugi a city located in Kanagawa Prefecture, Japan have for the first time started a verification test for a bus operational data display using electronic paper. An information display device has been setup at the No. 1 stop at the north exit of Odakyu Hon-Atsugi station from Sept. 10 to 25, 2007. The information display device features two sheets of electronic paper. One sheet displays timetables, switching the display every hour on weekdays and every two hours on holidays. The other sheet displays Atsugi City’s administrative information. Hitachi Ltd. provided the electronic paper device. The A4-sized e-paper device is approximately 9 mm-thick and weighs 600 g. The electronic paper only displays monochrome images. It is made of an electronic powder and granular material developed by Bridgestone Corp. Through this verification test, Kanachu and Atsugi City will determine the device’s resistance to direct sunlight, wind and rain, as well as challenges facing operation.